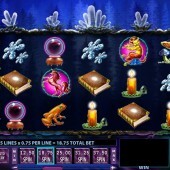 Crystal Forest is a 5 reel, 25 pay-line mystical themed slot game released by casino games developer WMS Gaming. It is one of the first titles in the WMS portfolio to be upgraded to HD, which possibly means the developer has a lot of faith in this slot. The game is one of the most inventive and creative slots in the WMS Gaming slots range and will appeal to fans of the developer’s other slots including the Irish-themed Leprechaun’s Fortune and the enchanting Wizard of Oz - Ruby Slippers. Symbols in the game include all things magical and make believe such as Unicorns, Dragons, Crystal Balls, Spell Books and Fairies. The Wild symbol substitutes for all other symbols to complete winning combinations and appears on reels 2 to 5. 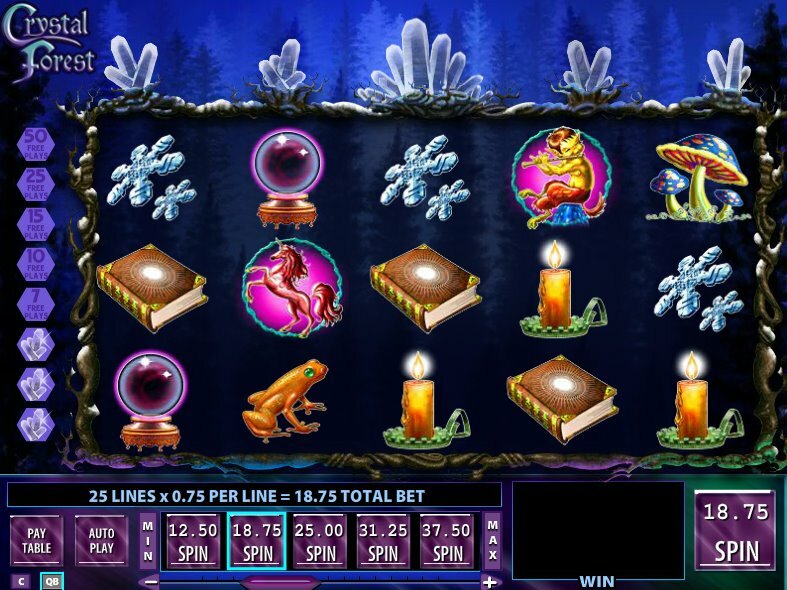 Crystal Forest includes cascading reels which gives you a fantastic chance to hit multiple winning combinations. The cascading reels work by the symbols that make up winning combinations disappearing and being replaced by symbols that fall from above. This can result in you hitting several winning combinations in a row. In fact, it is four consecutive cascading reels that trigger the free spins bonus feature. If you have four cascading reels in a row you will be awarded with 7 free spins. It is possible for you to win up to 50 free spins by triggering the feature after eight consecutive cascading reels. During the free spins bonus feature, a different set of reels are spun and if you hit four or more consecutive cascading reels during the free spins then you will re-trigger the free spins. Crystal Forest’s use of the cascading reels is a nice change of pace from other slots out there. If you hit a run of cascading reels you can really see some nice wins on this slot. These cascading reels do occur more frequently than you would think so it is an exciting feature with massive potential. If you ever get bored of Crystal Forest then you may want to try IGT's Pixies of the Forest, which is also from WMS. It has a similar theme, but also some unique characteristics to the game.